Amidst ancient cloisters, tall spires, leafy trees, dorms, the Upper Sixth, the ‘quad’, study teas, gowns and mortar boards dwells an indefatigably British spirit- that of the public school. Whether these surroundings actually do (or did) exist is a matter for conjecture- that they should exist a matter for poetical whimsy. It is against such a background that certain films stand like statues, their charm being undaunted by age or changing fashion- Boys Will Be Boys, Bottoms Up!- and now A French Mistress. More British than a Sunday roast eaten at Wimbledon, these films (which may have seemed even at the time either a throwback to a forgotten Tom Brown-esque era or to many a distant and unfamiliar phenomenon) are now valuable documents of social history, a reminder of a gentler time of respect, teamwork and tradition. It is a sad fact that, perhaps as a result of their perceptibly archaic status, such films are not widely available- rarely shown on television and often as not devoid of a video release. With DVD the situation is changing- and it is companies like Optimum that are to be thanked for dusting such scholastic treasures off and issuing them for the enjoyment of all. 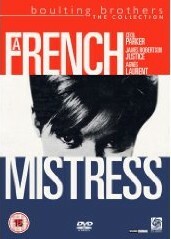 One such title- A French Mistress is a good case in point. Frustratingly elusive since its original cinematic release in1960, the film’s appearance on DVD is a very welcome one indeed. As the name implies, the film’s main premise is the arrival of a new female French teacher in a male-dominated public school. There is though much more to the film than this brief synopsis might suggest, the content weaving an intricate story among the staff (in whose midst familiar faces reassuringly appear- Irene Handl, James Robertson Justice and the ever underrated Raymond Huntley to name but three). Agnes Laurent and Ian Bannen provide competent support, although Bannen more closely resembles Thorley Walters (playing Governor Colonel Edwards) than his Father, Headmaster John Crane (Cecil Parker). Indeed, the latter gives a superlative performance, once more excelling in the role of the hapless leader (with more than an echo of his King Roderick I in The Court Jester, made five years previously). Perhaps the most refreshing things about A French Mistress are its lack of pomp and pretension- the film sticks to what it does well, and there are many moments that cause one to laugh out loud. Crucially, the moments of comedy are effortless- and not reliant on any dubious taste that seems to mark many more recent films. The print quality is excellent, the sound crisp and unmuddied, the whole experience a highly positive one. Ultimately, A French Mistress is a film that achieves what it set out to do- and provides over 90 minutes of genuinely delightful humour in the process. A French Mistress is available on DVD from Optimum Home Entertainment.